Writers, sculptors, painters, and collectors made Sheridan-Kalorama their home: best-selling mystery writer Mary Roberts Rinehart at 2419 Massachusetts; classicist Edith Hamilton at 2448 Massachusetts; poet/novelist Elinor Wylie at 2153 Florida; Willem de Looper, Dutch-born abstract painter, and Frederick Hart, sculptor of the National Cathedral's Creation Series, at 2219 California. Alice Pike Barney conducted an arts salon in her Waddy Wood-designed home at 2306 Massachusetts. The modern art collection of Joseph and Olga Hirshhorn, 2241 Bancroft, became the foundation of the Hirshhorn Museum and Sculpture Garden. About the artist: Peter Waddell, artist, here depicts the interior of the Barney Studio. 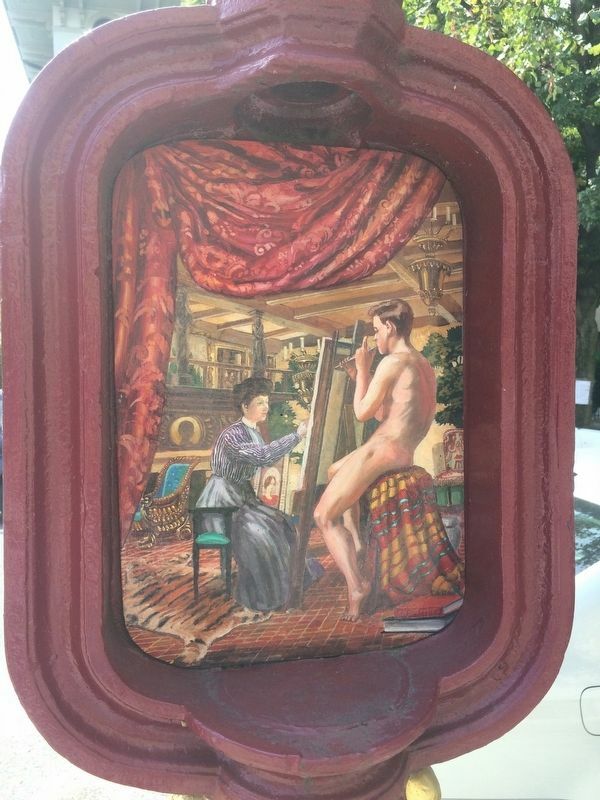 Art on Call, a program of Cultural Tourism, DC, funded in part by the Commission on Arts and Humanities, the Department of Transportation, and the Office of the Deputy Mayor for Planning and Economic Development. Call box locator map: Decatur Pl. and 22d St.
As mentioned on the marker: Alice Pike Barney conducted an arts salon in her Waddy Wood-designed home at 2306 Massachusetts...here depicts the interior of the Barney Studio. 38° 54.76′ N, 77° 2.935′ W. Marker is in Sheridan-Kalorama, District of Columbia, in Washington. 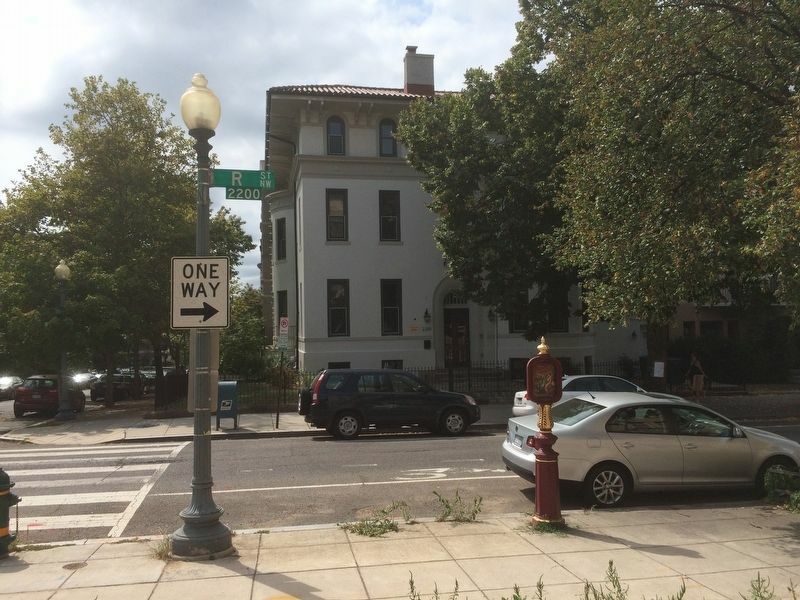 Marker is on R Street, NW near 22nd Street, NW, on the left when traveling east. Touch for map. 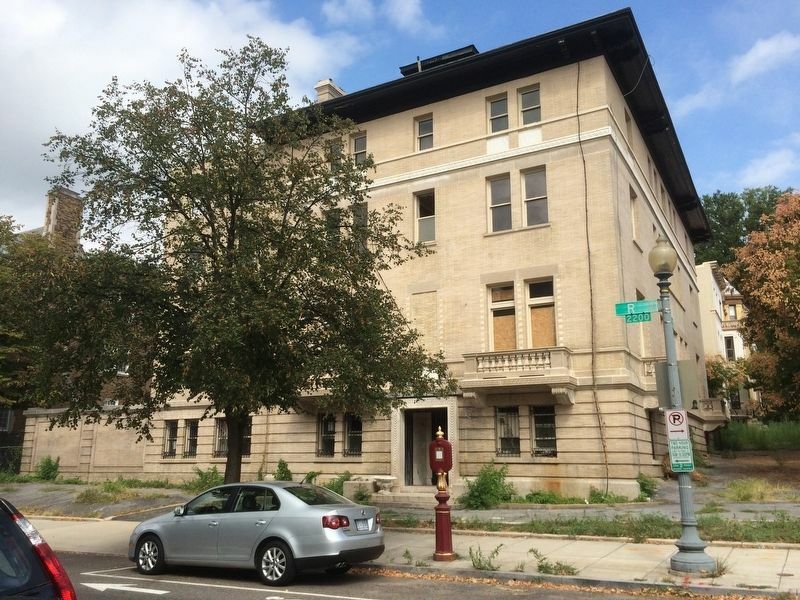 Marker is at or near this postal address: 2201 R Street, NW, Washington DC 20008, United States of America. Touch for directions. Other nearby markers. At least 8 other markers are within walking distance of this marker. Alberto Santos-Dumont (a few steps from this marker); American News Women's Club (within shouting distance of this marker); History of Sheridan-Kalorama (within shouting distance of this marker); Chief Justice Charles Evans Hughes (within shouting distance of this marker); George Washington (about 400 feet away, measured in a direct line); Eleftherios Venizelos (about 400 feet away); Liberation of the Grand-Duchy of Luxembourg (about 500 feet away); Assassination of Orlando Letelier and Ronni K. Moffitt (about 500 feet away). Touch for a list and map of all markers in Sheridan-Kalorama. A view of the marker towards the south along 22nd Street, NW. A view to the north of the marker across R Street, NW. More. 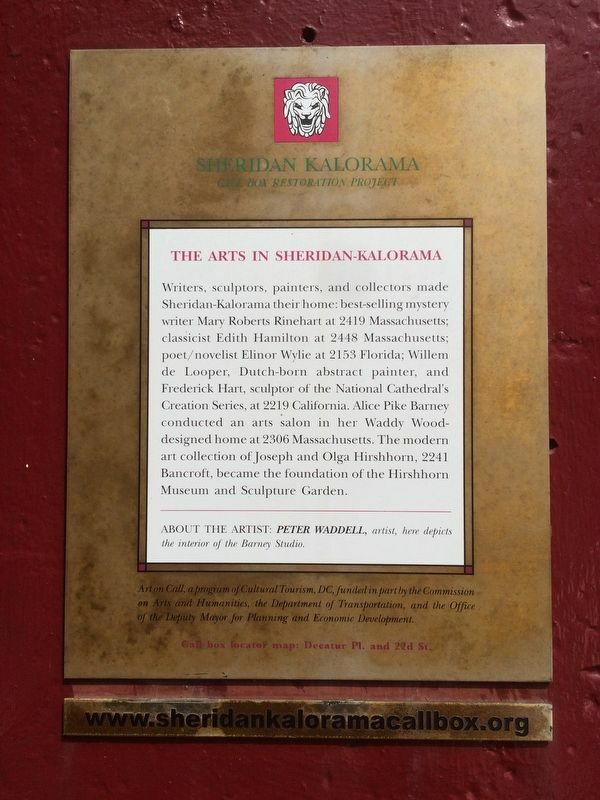 Search the internet for The Arts in Sheridan-Kalorama. Credits. This page was last revised on January 27, 2017. This page originally submitted on November 4, 2016, by J. Makali Bruton of Querétaro, Mexico. This page has been viewed 202 times since then and 4 times this year. Photos: 1, 2, 3, 4. submitted on November 4, 2016, by J. Makali Bruton of Querétaro, Mexico.